Our score for The Grub Stake is contained on volume III of the Idaho Film Collection's dvd overview of Nell Shipman's work; volume III is entitled From Lionhead Lodge, and contains all of Shipman's surviving Idaho films. More information about the dvd collection, as well as about Nell Shipman, can be found at the Idaho Film Collection website. You also can hear an interview by Trusky about Nell Shipman with KBSU's Samantha Wright here. For roughly the second half of the interview the background music is taken from our recording of The Grub Stake soundtrack. 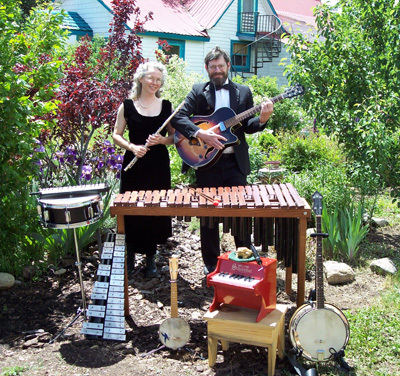 Welcome to the home page of the Bijou Orchestrette, Indian Valley Idaho’s only silent movie band. Like its twin, Five & Dime Jazz, the Bijou Orchestrette consists of two musician/composers, Eberle Umbach & John Hayes. We began The Bijou Orchestrette in 2004 as a larger combo we played in was breaking up. Eberle was looking for some new opportunities for composing, & a mutual interest in silent films led us to see if we could compose & perform these scores. Eberle was aware of Nell Shipman, an actress/writer/producer/director, etc. who'd worked from a studio in Priest Lake, Idaho in the mid 20's, & we decided to try our hand at composing a score for her 1919 hit, Back to God's Country. With the assistance of a grant from the Idaho Commission on the Arts, as well as with help from Tom Trusky of Boise State’s Idaho Film Collection, we were able to complete the Back to God’s Country score. After Tom Trusky heard us perform this score at McCall, Idaho's Alpine Theater, he asked us to work on a score for The Grub Stake. The Grub Stake hadn't been released by the IFC when it put out most of Shipman's work on videotape, but Trusky was planning to release all the surviving Shipman films as a dvd collection, & needed scores for the previously unreleased films.